NEW YORK—A traveler can show us how to appreciate our native backyard more than we might have otherwise. Thomas Cole (1801–1848) was such a man. Born in Lancashire, England, where he witnessed the Industrial Revolution polluting the air as much as the morale of people who were being replaced by machines, Cole migrated with his family to this country at the age of 17 for economic reasons. By his 20s, he had fallen in love with the American wilderness and launched what has become the distinctively American style of landscape painting—the Hudson River School. 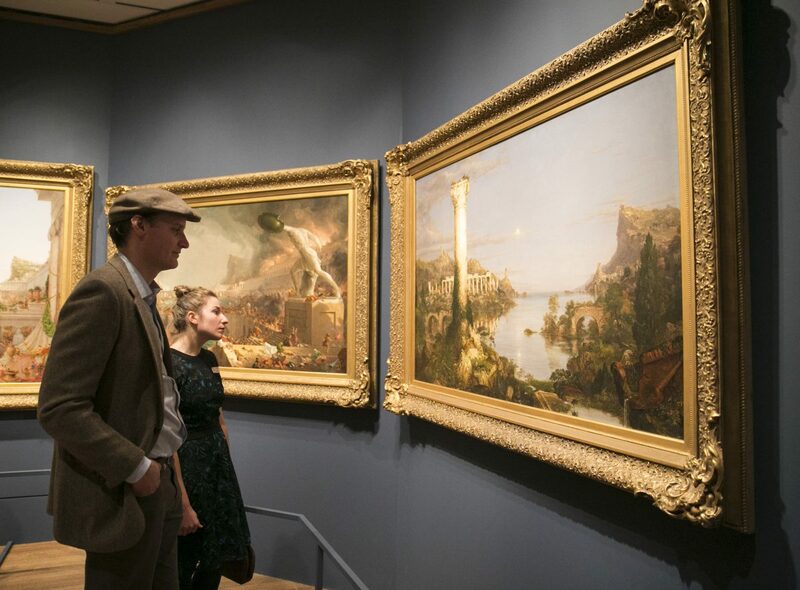 The Metropolitan Museum of Art’s exhibition “Thomas Cole’s Journey: Atlantic Crossings” marks the 200th anniversary of his arrival in this country. The same year that Cole became naturalized in 1834, he created his five-part masterwork series chronicling the rise and fall of human civilizations, “The Course of Empire” (1834–36), and, at around the same time, “The Oxbow” (1836). These works were painted with an embedded warning. He “wants to speak to his fellow citizens, providing this moral message that while great civilizations rise and fall, it will always be nature that will be permanent. It’s God’s pure creation,” said Elizabeth Kornhauser, the organizer and curator of the exhibition, during a “MetFridays” event on Feb. 23. While we usually associate Cole with the Hudson River Valley and its surrounding area, this exhibition and its catalog give us a more comprehensive understanding of Cole in a global context. Highlighting his travels across the Atlantic, to England and Italy between 1829 and 1832, it takes us through his training and engagement with masters like J.M.W. Turner, John Constable, and John Martin. It then showcases his greatest masterpieces, which expressed what came to be known as the new American sublime, and ends with his legacy in the works of the painters he mentored, notably Asher B. Durand and Frederic E. Church. After its run at The Met until May 13, the exhibition will travel to London to be displayed at The National Gallery from June 11 to Oct. 7, 2018. The focus and timing of “Thomas Cole’s Journey: Atlantic Crossings” couldn’t be better, because Cole’s influence extends not only across geographical distances but also through time. In the past, the Hudson River School paintings had been rediscovered and sought after for solace in the darkest days of the Great Depression and of World War II. Now, The Met has given us an opportunity to seek them out again for nourishing the soul. It’s difficult not to feel uplifted at the exhibition, even when looking at paintings depicting ruins, dark cumulus clouds, or threatening storms. When we look and contemplate longer, different emotions are awakened ever so gently. A sense of expansion, of peace and resolve, of awe and gratitude. We may notice that there are few shadows in Hudson River School paintings. Indeed, “light provides the primary formal structure in these paintings,” the art critic James F. Cooper pointed out in his book “Knights of the Brush: The Hudson River School and the Moral Landscape,” which makes a case for their timelessness. “Hudson River School painting puts us in contact with those unique qualities of beauty, spirituality, and virtue that artists provide to make order out of chaos, to make light out of darkness, to make faith out of despair, to make beauty out of ugliness, to make transcendence out of alienation,” Cooper wrote. “Nature has shed over this land beauty and magnificence,” Cole wrote in his “Essay on American Scenery,” published in 1836. The transcendent and poetic interpretations of the landscape, the quest for truth in the beauty of nature, and for meaning therein, is endless. Although the ideals that were instilled in Hudson River School painters in the 19th century may have been eclipsed by the changing tastes during the rise of modernism in the 20th century, those ideals are contagious. Like saplings emerging between concrete slabs and becoming fully developed trees, a good number of landscape painters are succeeding as they follow in the footsteps of the Hudson River School. Among them are Lauren Sansaricq and Erik Koeppel. They were awarded a Hudson River Fellowship (of Grand Central Atelier) and met while painting Kaaterskill Falls, which Cole first sketched on-site in the Catskill Mountains in 1825. 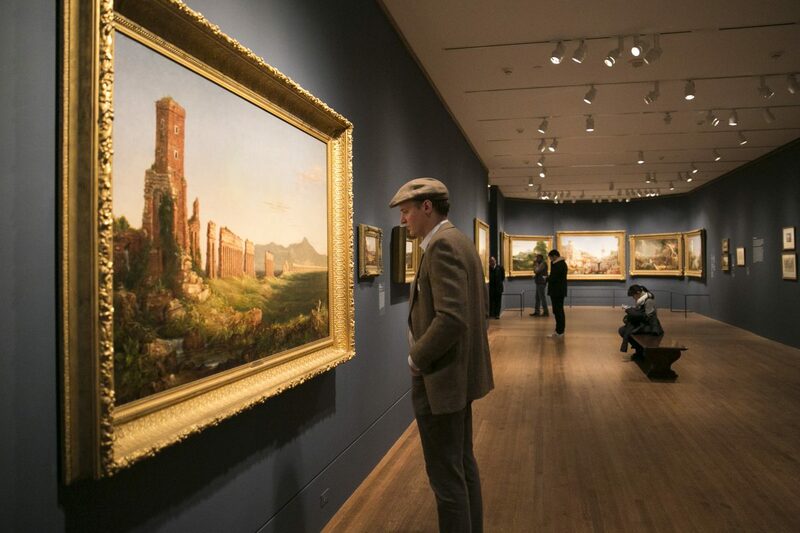 The couple visited “Thomas Cole’s Journey” at The Met on Feb. 26 around the same time that their own paintings were exhibited at a private club in midtown Manhattan. They walked wide-eyed through the gallery in The Met’s American Wing. 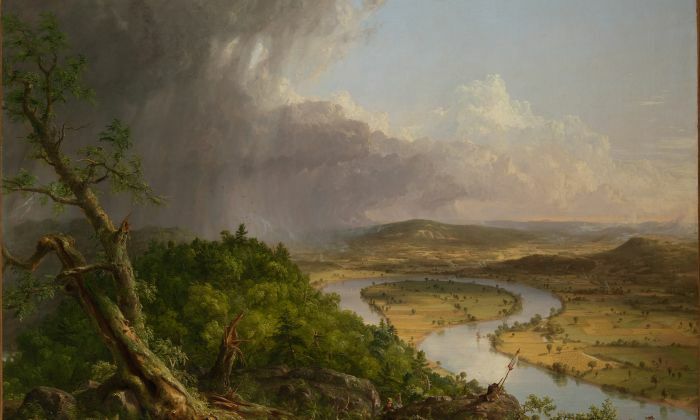 Looking at a painting by Turner, Koeppel then explained how Turner and Thomas Moran had learned from Johann Wolfgang von Goethe’s color theory, how they had influenced Cole, and, in turn, how Cole had influenced the Hudson River School. “There has to be quantities of red, yellow, and blue in everything, and you vary the quantities in order to have the color atmosphere move around the picture,” Koeppel explained. “The way your eyes are perceiving color at any given moment is constantly changing based on the levels of light. For example, if the sun goes behind a cloud or if you zero-in on one thing as opposed to something else, your perception of color changes. It’s one of the harder things to quantify in paintings,” Koeppel said. Both Sansaricq and Koeppel spent many years learning the technical skills necessary to evoke the emotional responses from the viewer that they want to convey with their brushwork, with glazing (applying several thin layers of paint over time), with harmonizing warm and cool colors, and so forth. “It’s kind of a continuous struggle to get a real poetic impact,” Koeppel said. “He definitely romanticized the view,” Sansaricq said. “Sanford Gifford is one of my favorite landscape painters. I’m definitely fascinated by this view and his incredible interpretation of it,” she said. 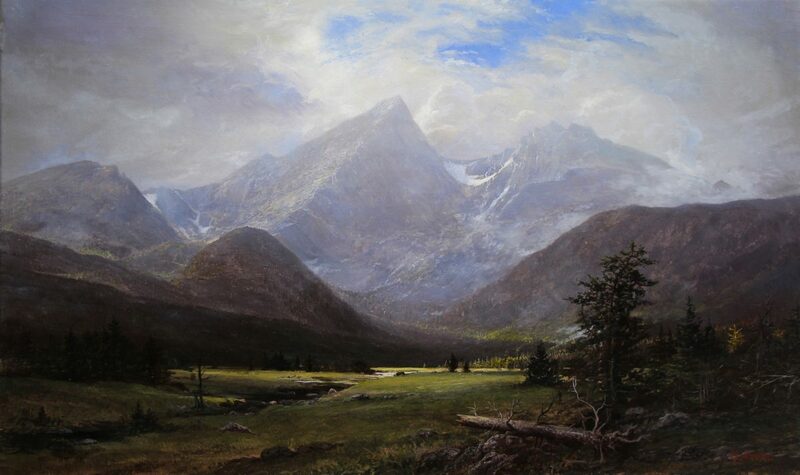 Koeppel’s painting “Clouds of the Moat Mountains” is a view that Albert Bierstadt (1830–1902) painted before him. 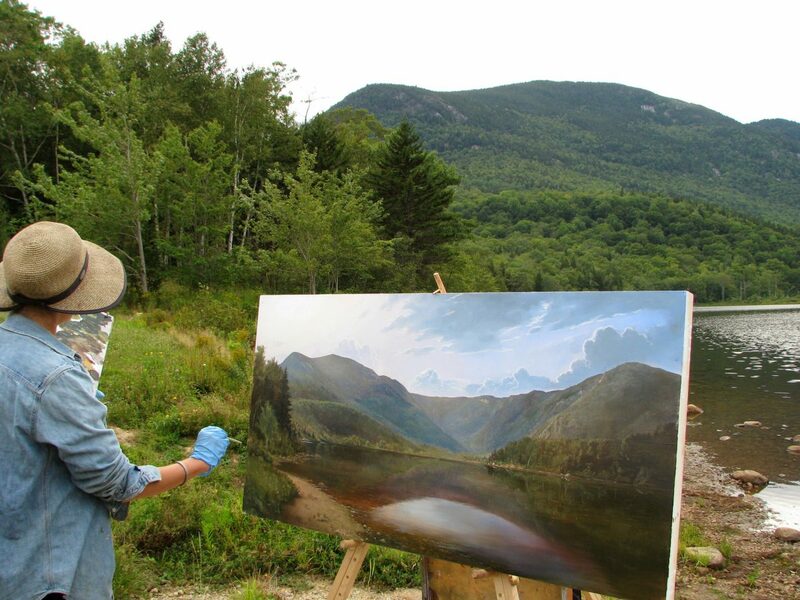 The couple have also painted views of the Catskills, the Rockies, and the Maine Coast. These views are like classical music compositions that can be reinterpreted in an infinite number of ways by different conductors or musicians across centuries. It is not surprising, then, that art collectors who own Hudson River School paintings also own paintings by Sansaricq and Koeppel. 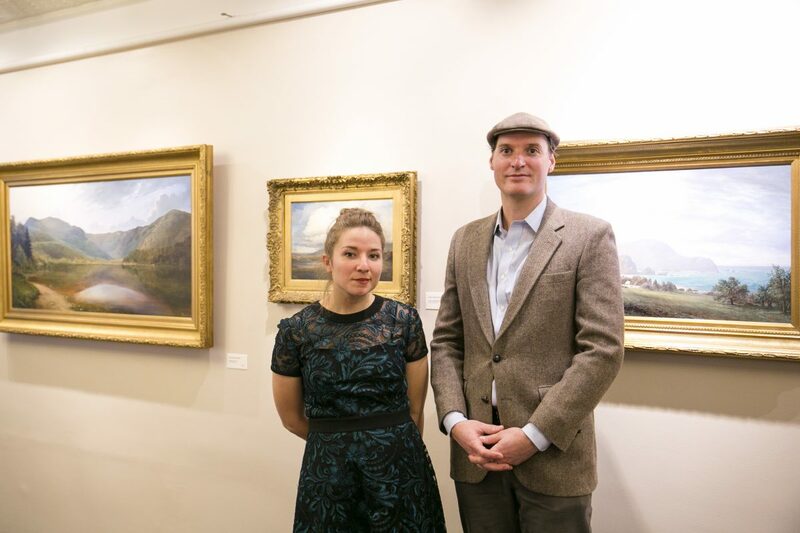 Lauren Sansaricq and Erik Koeppel at an exhibition of their paintings in New York City, on Feb. 26, 2018. “When you have a set ideology and different artists bring it into fruition, it gives you the freedom to create with that sort of vision, but with your own voice. You might be influenced by atmosphere from Gifford, or poetic elements from Cole, for example,” Koeppel said. 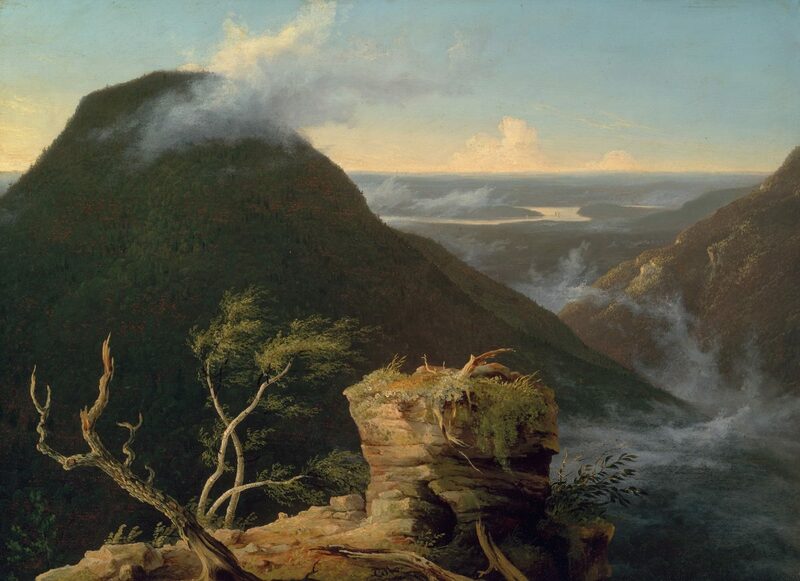 The ideology that Sansaricq and Koeppel have embraced, namely the transcendentalism of the Hudson River School, stemmed from German mysticism and romanticism led by the philosophers Goethe, Immanuel Kant, and Novalis. It took root in America, uniting the Hudson River School painters with poets and writers like Ralph Waldo Emerson and Henry David Thoreau, who believed in self-reliance and in perfecting themselves through a spiritual relationship with nature. In this sense, the artist has a moral purpose in expressing what is sacred. Commenting on how some young artists today might get caught up with determining their artist statements, with the idea of having to be original, Sansaricq pointed out that, in a sense, an artist’s voice is not something that has to be manufactured. “Your voice is always going to be there no matter what you do! Erik and I try to focus only on what we see as the beauty of the landscape, and our own individual, unique selves will come through in the paintings, no matter what, unintentionally,” Sansaricq said. “We find the spirituality in the beauty of nature, and we hope that the people who enjoy our artwork do so as well,” Koeppel added. Paintings by Lauren Sansaricq and Erik Koeppel will be displayed at the exhibition “The White Mountains: Alps of New England,” honoring the 100th anniversary of the White Mountain National Forest, at Museums of the Bethel Historical Society in Bethel, Maine, from May 29 to Oct. 19, 2018.